1.Spreading and imposing a concept of democracy based on the US requirement of a two-term limit and decrying Chavez as a dictator because he ran in 1998, had a referendum in 1999, re-elected in 2006, and 2012.of course if he participating a war there is a US precedent, during the second world war, for more than two terms. 3. Working with opposition to organize rallies and instigate conflict resulting in the international condemnation of the government. 5.Funding US Agency for International Development (USAID) and the Office of Transition Initiatives (OTI). which includes “over 300 Venezuelan civil society organizations”,for the “penetrating of Chavez’s political base ... dividing Chavismo ... protecting vital US business ...[and] isolating Chavez internationally”. 6. Funding Development Alternatives Inc. (DAI).In 2002, DAI worked with the National Endowment for Democracy (NED) to fund a right-wing propaganda campaign during the 2002 oil industry lockout that sought to bring down Chavez’s government. 7.Since 2009 establishing military bases, in Colombia, along the border with Venezuela. Using pretext for military intrusion into adjacent state, Ecuador; this action posed a threat to Venezuela’s sovereignity. The letter called on the organization to end its exchange of personnel with the U.S. government, arguing that the relationship has affected HRW’s research and advocacy against human rights abuses, particularly those committed by the U.S. government. A revolving-door policy of Human Rights Watch is one in which high-level U.S. foreign policy staff—those who have crafted and executed U.S. foreign policy—are allowed into Human Rights Watch as staffers, advisory committee members, and as board members. Human Rights Watch has lobbied for long time for Israel to be part of the influential negotiating group JUSCANS, and has finally been successful. Israel now member of the UN regional group JUSCANS (japan US Canada, Australia, new Zealand, and now Israel) which has a disproportionate influence in the negotiation process at the United Nations. 13.Hoarding food products, by supermarkets affiliated with the Venezuelan opposition so they can resell them at higher prices. Redirecting produce from the public to the private sector, and re-selling the produce to Venezuelans living close to or in Colombia.
. But the biggest impact from Venezuela’s currency woes came from Procter & Gamble. The world’s largest consumer products maker on Thursday announced a $2.1 billion charge against earnings, reflecting the company’s inability to convert Venezuela’s currency or pay dividends. Beginning in the third quarter, P&G will exclude the operating results of its Venezuelan subsidiaries from its consolidated financial statements. Hits to U.S. corporate profits in Venezuela accelerated in February when the President Nicolas Maduro devalued the bolivar by 70 percent via a new currency system known as Simadi. Previously, many U.S. companies valued their monetary and non-monetary assets at the most preferred rate of 6.3 bolivars to the dollar. But under Simadi, the exchange rate has been around 200 bolivars. three- person committee that wrote a report leading to a complaint to Ocambo , the former head of the International Criminal Court against Venezuela for crimes against humanity. When he was the head of ICC, Ocambo had refused to take on a case against Israel. 17. US oil refining interests that import Venezuelan oil. But the administration has floated the idea of tapping the US strategic petroleum reserves to soften the blow. 18.Threatening an invasion and regime change. Pompeo recently admitted that the US would like to see regime change in Venezuela, the country with the largest oil reserves on earth. Oscar Ortiz Santa Cruz de la Sierra Bolivia responds to the situacion inVenezuela Óscar Ortiz, was elected president of the Union of Latin American Parties (UPLA), to work internationally in the defense of democracy in the Latin American region, with special emphasis on solidarity with the suffering of the Venezuelan and Nicaraguan peoples, in which “the authoritarian regimes are running over to the most fundamental right, as is the right to life”. 2018The US state department expressed “deep concern” over the ruling, and some Bolivian opposition leaders, warning of an imminent “Venezuelan-Cuban-style” dictatorship, have called for street demonstrations, although few expect serious unrest.In Venezuela, President Nicolás Maduro’s leftist government recently banned the three biggest opposition parties from running in a presidential election this year, following a deadly crackdown against protesters (New York Times).2018 Bolivia scrambles to maintain unity amid US support for right wing. Given the clearly right wing nature of the parties in the countries that withdrew from Union of South American Nations(UNASUR), the move can be seen as the latest blow against a fading trend of left wing governments and a result of the increasing bitter inter-state swirling around Venezuela’ s future. (Elliot Gabriel). The electoral campaign covered most of 2017, resembling the US model of extended political competition with its own dynamics and logics. Chilean experts employed much of their capacity to explain the impact generated by the vague fear of middle-class, centrist voters and conservative segments that a triumph of Guillier would lead Chile down Venezuela’s path towards unprecedented political and economic chaos. In retrospect, it was a politically astute move for Piñera’s team to brand any leftist constellation as “Chilezuela“. On social networks there was a viral spread of content that compared Guillier with Venezuela’s president Nicolás Maduro and claimed that a Guillier government would ultimately generate similar results – though this was of course highly unlikely. Numerous media contributions also suggested links between a Piñera defeat, the risk of communism, the end of social order, and general democratic degeneration. The situation in Venezuela was used by the right wing in the Colombian election. Time magazine reports on what is described as “the specter of Venezuela’ Petro’s anti-corruption platform has turned him into a real contender in this election. But he has the misfortune of running at a time when neighboring Venezuela is imploding. More than 200,000 Venezuelans streamed into (and through) Colombia last year to escape crushing poverty and lack of basic goods and medicines, a six-fold increase from the year before. The perpetually looming collapse of Venezuela is a constant reminder to. Hundreds of thousands of Venezuelans have sought refuge in Colombia as their own country has descended into economic chaos. And while Venezuelans cannot vote here, their advocacy, activism — and calls for divine intervention — may help push Duque over the finish line on Election Day. (Miami herald). Ivan Duque has compared Venezuelan President Nicolas Maduro's management of his country to a man who beats his wife and children, saying that Colombia has a moral responsibility to speak out against his government. At the same time, right-wing candidates have used the crisis against the leftist Gustavo Petro, a vocal supporter of Venezuela's former leader Hugo Chavez, warning that his leftist policies could turn Colombia into a "second Venezuela". Ecuador pro-business candidate Guillermo Lasso has doubled down on accusations that government-backed candidate Lenin Moreno would turn the Andean country into Venezuela, alluding to a recent Supreme Court move there to neuter the national assembly that foes denounced as a lurch into dictatorship. 2004,the Salvadoran media and certain US government and non-government officials stoked fears amongst the voters regarding the consequences of an FMLN victory by again linking the FMLN to the Venezuelan socialist. In 2009 civic associations not registered as political parties carried out media campaigns associating the FMLN with Chávez in order to stir up support for ARENA. In 2014 even before the election there were articles criticizing Venezuela and especially ALBA. Sanchez Ceren's may need to enter into a coalition with Tony Saca to assuage fears that the FMLN will pursue communist or ‘Chavista’ policies and Sánchez Cerén need to demonstrate that Venezuela’s influence and money can be kept at arm’s length. (Diana Negroponte).The ARENA candidate used the reported situation in Venezuela to support his campaign, "we do not want our country to fail as Venezuela has". There were constant references in the right wing paper the Prensa Graphic and TV reports profiling suffering Venezuelans and warning .Salvadorians not to vote for the FMLN candidate. A full page about US and Venezuela. Head line Venezuela falls short in human rights; the United States put Cuba Venezuela and Ecuador in a list of countries that do not respect human rights, citing corruption, impunity, the lack of judicial independence, restrictions on freedom of speech as problems in all of Latin America. Head line senators urge sanctioning repression. Head line they warn that the Venezuelan crisis could affect ALBA. Negative publicity about ALBA and especially about Venezuela to support ARENA. ARENA candidate warned that the FMLN Sanchez Ceren would follow the path of Venezuela’s socialist government, which has taken over private businesses, and promised he would not allow others to send El Salvador down the road of Venezuela. In the Prensa Grafica. February 28, 2014 front page the Venezuelan crisis worsens information about Venezuela in 5 other pages. US congratulates Jimmy Morales from Guatemala for supporting Jerusalem as capital of Israel and for opposing Venezuela and the crisis in Venezuela and its abusive dictator (translated from Spanish CNN, meeting with Trump and US UN representative. President, Barack Obama, showed a desire to end the "gringo bully" image by condemning the June coup which ousted the leftist leader, Manuel Zelaya. But the White House backtracked when congressional Republicans supported the de facto government as a bulwark against Venezuela's Hugo Chávez... It was said he had ignored court rulings that made his referendum unconstitutional and was seeking to perpetuate his presidential term like his ally, Venezuelan President Hugo Chávez, had already done in Venezuela on numerous occasions. Behind “the 2009 coup” in Honduras was the specter of Venezuela. Zelaya had turned to leftist coalitions and unions for support of his agenda and to the horror of the political elites, he joined petrocaribe and the Bolivarian alternative for the Americas (Alternativa Bolivariana Para las Americas – ALBA), Chavez’s regional economic and political alliance, which acted as a counterweight to the US-led trade agreements in the region. In 1952, a popular uprising against a rightist military regime led to the left-leaning nationalists of the Movimiento Nacionalista Revolucionario (MNR) coming to power promising political freedom and radical economic reform. As with Morales and MAS, his political party, that revolutionary government had support from militant worker and peasant political movements. Also, like today, the new government’s policies were nationalistic, particularly about country’s natural resources, in which U.S. investors had substantial interests. 1964. René Barrientos, who seized power in a military coupwas backed by foreignors. The CIA and U.S. Special Forces played a key role in suppressing a leftist peasant uprising that followed. 1971. By August of the following year in a bloody uprising, also with apparent U.S. support. Thousands of suspected leftists were executed in subsequent years. 1982. The United States largely supported Bánzer and subsequent dictators in the face of a series of protests, general strikes and other largely nonviolent pro-democracy uprisings, which eventually led to the end of military rule by 1982. 1982. The coming to office of the left-leaning president Hernán Siles Zuazo. Despite the restoration of democracy, the strict austerity programs pushed by the United States and the International Monetary Fund (IMF) resulted in the Bolivian people, more than two-thirds of whom live in poverty, even though the majority of the population is indigenous, the country’s leaders continued to be white or mestizo (of mixed-race heritage). 2005. The election of Evo Morales, a left-wing activist and the first indigenous leader in the nearly 500 years since the Spanish conquest, marked a major shift in Bolivia’s politics. Under Morales, Bolivia has attempted to strengthen the Andean Community of Nations and the signing last year of a “People’s Trade Treaty” with Venezuela, Nicaragua, and Cuba is indicative of the desire to strengthen working economic and political alliances outside of direct U.S. influence in order to be better able to stand up to Washington. 2018. Yet Bolivia, along with Nicaragua, is now the only presidential democracy in the Americas to place no limits on re-election. Last month, a senior minister shared an image of a placard which invited Morales to stay in power until 2050.
to work internationally in the defense of democracy in the Latin American region, with special emphasis on solidarity with the suffering of the Venezuelan and Nicaraguan peoples, in which “the authoritarian regimes are running over to the most fundamental right, as is the right to life”. When he first entered office, Mr. Morales, part of a group of leftist leaders in Latin America who rose to power at a time of high commodity prices, sought to tackle a history of inequality in Bolivia. He strong-armed foreign energy companies to share more profits with the state, investing the proceeds in education and health care while rewriting the country’s Constitution to speed his reforms. The above momentum has top officials in La Paz arguing that now is not the time to cut short a productive presidency on what they argue are the mere technical grounds of term limits. “From being a republic of classes, castes, skin colours, Bolivia today has become a country that by law has to be inclusive,” said Valeria Silva Guzmán, 27, a Mas congress woman. Through slashing school truancy, infant and maternal mortality, and old-age poverty, she argued, Morales has “definitively changed the everyday reality of Bolivians”. RATIONALIZATION; "a victim of all left-wing groups around the world” “In the United States, as you know, we are sympathetic with what you are trying to do here," then Secretary of State Henry Kissinger privately confided to the Chilean dictator, General Augusto Pinochet, in June 1976. At the height of the military regime's repression, according to a recently declassified memorandum of conversation, Kissinger told Pinochet that the junta was "a victim of all left-wing groups around the world" and that Washington "wishes you well." Kissinger was fully aware of what General Pinochet was "trying to do" in Chile. A secret briefing paper prepared for the Secretary of State after the September 11, 1973 coup d'état reported that in the 19 days following the coup, the new military junta had summarily executed 320 individuals—three times as many people as was then publicly acknowledged. The memorandum, entitled "Chilean Executions" and based on intelligence sources in Santiago, estimated "total dead" at 1,500 from the coup. It also reported on how the United States was expediting military and economic assistance to the new regime, despite concrete documentation of its atrocities. These are but two of many documents that have emerged recently on Washington's role in supporting General Pinochet, and on the human rights atrocities committed during his rule. While the full story remains hidden in secret U.S. government vaults in Washington, public pressure in the aftermath of Pinochet's stunning arrest in London on October 16, 1998—from the families of U.S. and Chilean victims, from organizations like the Institute for Policy Studies, Amnesty International, Human Rights Watch and the National Security Archive, and from the Spanish courts—has forced the Clinton Administration to undertake a major review of its classified archives on Chile. SECRET/SENSITIVE," "EYES ONLY," "NODIS" (no distribution to other agencies) and "NOFORN" (no foreign distribution), the documents include State Department cables, CIA memoranda and National Security Council (NSC) option papers. They disclose new details on what was already known about human rights abuses under General Pinochet, the decisions of the Nixon and Ford White House, activities of the U.S. Embassy, and covert operations of the CIA in Chilean politics. "Salvador Allende's election cannot be charged to lack of early warning," states a CIA "Postmortem on the Chilean Presidential Election" drafted for Henry Kissinger in November 1970. In 1968, CIA analysts first anticipated that Allende's Popular Unity coalition could win in Chile. On March 25, June 27, and August 7, 1970, Henry Kissinger chaired meetings of the 40 Committee—a high-level interagency group that authorized covert operations to "denigrate Allende and his Popular Unity coalition," as one CIA summary prepared for Kissinger two days after the coup described them. On August 18, the State Department submitted a 23-page "review of U.S. policy and strategy in the event of an Allende victory" to the White House. "We identify no vital U.S. national interests within Chile," that assessment concluded. "In examining the potential threat posed by Allende, it is important to bear in mind that some of the problems foreseen for the United States in the event of his election are likely to arise no matter who becomes Chile's next president." Nevertheless, U.S. Embassy reports (obtained through the Freedom of Information Act by the author) reveal a frantic, minute-by-minute reaction to the events of September 4, 1970. Dozens of cables written by Ambassador Edward Korry—known in the Department of State as "Korrygrams" for their unique language and undiplomatic opinions—flowed to Washington. On election day, Korry sent no fewer than 18 election updates on the vote count. On September 5, he reported that he could hear "the mounting roar of Allendistas acclaiming their victory" from the streets. "We have suffered a grievous defeat," Korry wrote, blaming the political "poverty" of the Christian Democrats and the "myopia of arrogant stupidity" of Chile's right-wing upper class. "Leadership depends upon, if I may use Spanish, cabeza, corazon and cojones (brains, heart and balls)," Korry concluded his cable. "In Chile they counted upon chachara (chatter)." Over the next three weeks, the Ambassador sent a constant series of SECRET/NOFORN reports with such titles as "No Hopes for Chile," and "Some Hope for Chile?" A number of cables focused on what Korry skeptically described as "an undercover organizational operation" in which the Chilean Congress would vote on October 24 for National Party candidate Jorge Alessandri, "who would renounce the presidency and thus provoke new elections in which Frei would run." Korry's cables show that he viewed then-President Eduardo Frei as the only possible obstacle to Allende's ascension to the presidency. In a secret September 9 cable, titled "One and Only One Hope for Chile," Korry argued that "the future of Chile would be decided by only one man: Frei. I believe he is playing his cards with extraordinary astuteness in the circumstances." In a September 22 cable, "Frei: Transacting the Future," Korry described the President as "the central figure" whose "moves determine the pace, the direction and the form of a situation that has far more flux than 99.99 pct. of the Chileans know." The U.S. Ambassador repeatedly met secretly with Frei to urge him to annul the election. The CIA pursued a more forceful set of operations to pressure Frei. "CIA mobilized an interlocking political action and propaganda campaign designed both to goad and entice Frei" into the "so-called Frei re-election gambit," according to a declassified "Report on CIA Chilean Task Force Activities." to induce President Frei to prevent Allende's election by the Congress on 24 October, and, failing that, to support—by benevolent neutrality at the least and conspiratorial benediction at the most—a military coup which would prevent Allende from taking office. The task, as the CIA put it, was to use propaganda and pressure "to recast Frei as a political personality, in a role demanding decisiveness and 'machismo' to a degree that, thus far, had eluded him." The pressures the CIA brought on Frei included offering substantial sums of money to his "re-election" campaign, bribing fellow Christian Democrats to prod him and oppose Allende, and orchestrating visits and calls from respected leaders abroad. In an effort to influence Chile's president through his wife, the CIA instigated a series of telegrams to Mrs. Frei from women's groups in other Latin American nations, as well as mailings of CIA-planted news articles on Chile's peril from around the world. These were part of a covert black propaganda campaign which, the CIA boasted, resulted in at least 726 stories, broadcasts and editorials against an Allende presidency. "On 3 November 1970, Dr. Salvador Allende became the first democratically elected Marxist head of state in the history of Latin America—despite the opposition of the U.S. Government," CIA director Helms wrote in a "Post-mortem on the Chilean Presidential Election." As a result, "U.S. prestige and interests ... are being affected materially at a time when the U.S. can ill afford problems in an area that has been traditionally accepted as the U.S. 'backyard.' "
Indeed, CIA operations had failed. Frei refused to influence the Christian Democrat party to block Allende's ratification. "Frei did manage to confide to several top-ranking military officers that he would not oppose a coup, with a guarded implication he might even welcome one," Helms reported to Kissinger. But when the "coup opportunity" presented itself with the October 22, 1970 assassination of General René Schneider, "Frei moved quickly away from it," according to the CIA. The Agency's extensive efforts to promote a military coup in Chile—known as Track II—were revealed by the U.S. Senate Select Committee led by Senator Frank Church in the mid-1970s. For the first time, however, the actual CIA documents on "Project FUBELT"—codename for the covert operations to destabilize the Allende government and foment a military takeover—have been publicly released. For example, a secret/sensitive "eyes only" memorandum, "Genesis of Project FUBELT," dated September 16, 1970, records the first CIA meeting on the Chile operations. "President Nixon had decided that an Allende regime in Chile was not acceptable to the United States," Helms told CIA officials from the Directorate of Plans—the CIA's covert operations section—and the Western Hemisphere Division. "The President asked the Agency to prevent Allende from coming to power or to unseat him." Within 48 hours, according to a secret summary of the meeting, the CIA was to provide an action plan to National Security Advisor Henry Kissinger. that the Agency should continue keeping the pressure on every Allende weak spot in sight—now, after the 24th of October, after 5 November, and into the future until such time as new marching orders are given. It is firm and continuing policy that Allende be overthrown by a coup. It would be much preferable to have this transpire prior to 24 October. But efforts in this regard will continue vigorously beyond this date. We are to continue to generate maximum pressure toward this end utilizing every appropriate resource. During Allende's aborted tenure in office, the CIA continued attempting to foment a coup climate in Chile. Covert funds were funnelled into the Chilean congressional campaigns to bolster anti-Allende politicians, according to a still-heavily censored summary of covert political action prepared by CIA director William Colby two days after the coup. Even more important, the CIA secretly poured $1.5 million into the conservative newspaper, El Mercurio—an operation, according to CIA documents, that "played a significant role in setting the stage for the military coup of September 11, 1973." Covert agents also maintained close liaison with disgruntled Chilean military officers. To keep the military on edge, the CIA planted false propaganda suggesting that the Chilean left planned to take control of the armed forces. According to the Senate Select Committee report, the CIA even prepared arrest lists of Allende supporters in the event of a military takeover. "Track II was never really ended," Thomas Karamessines, the CIA official in charge of the Chile operations, testified before the Senate Select Committee in 1975. "What we were told to do was to continue our efforts. Stay alert, and do what we could to contribute to the eventual achievement of the objectives and purposes of Track II." CIA operations constituted the covert leg of what U.S. officials called "a triad" of policy approaches to Chile. The public approach, according to National Security Decision Memorandum 93 titled "Policy Toward Chile," was defined as a "correct but cool" diplomatic posture. Overt hostility, cautioned recently declassified SECRET/SENSITIVE strategy papers prepared for Henry Kissinger on the day of Allende's inauguration, would "serve Allende's purpose of rallying the Chilean people around him in the face of the 'foreign devil.' "
The third leg of U.S. policy has come to be known as the "invisible blockade" of loans and credits to Chile. For years historians have debated if such a blockade existed, or whether Allende's socialist economic policies led to a loss of economic credit. Recently declassified NSC records on Chile show conclusively that the Nixon Administration moved quickly to shut down multilateral and bilateral foreign aid to Chile—before Allende had completed a month in office. At the Inter-American Development Bank (IDB), the NSC simply informed the U.S. representative that he did not have authority to vote for loans to Chile. According to a SECRET/NODIS "Status Report on U.S. Stance on IDB Lending to Chile"—prepared for Dr. Kissinger several weeks after Allende's inauguration—"the U.S. Executive Director of the Inter-American Development Bank understands that he will remain uninstructed until further notice on pending loans to Chile. As ... an affirmative vote by the U.S. is required for loan approval, this will effectively bar approval of the loans." At the World Bank, U.S. officials worked behind the scenes to assure that Chile would be disqualified for a pending $21 million livestock-improvement credit and future loans.Unable to simply veto loans, the State Department's Bureau of Inter-American Affairs prepared a series of questions for a World Bank delegation to pose to authorities in Santiago in an effort to show that Allende's economic policies did not meet criteria for credits. "The Executive Director will routinely and discreetly convey these questions to Bank staff members," another NSC "status report" noted, "as to insure adequate attention to them by the team visiting Chile and by other staff elements within the Bank, but without the hand of the U.S. Government showing in the process." In addition, the president of the Export-Import Bank agreed to "cooperate fully" with Assistant Secretary of State for Inter-American Affairs Charles Meyer on the discontinuation of new credits and guarantees to Chile. would be most unlikely to win sufficient support. Such an effort would, in addition, be highly divisive; would, if sponsored by the U.S., be a decisive and dramatic act of open hostility toward Chile; would alienate many of our Latin American supporters; and would project an unfavorable public image. "Chile's coup d'état was close to perfect," states a "SitRep" (situation report) from the U.S. military group in Valparaíso. The report, written by Marine Lt. Col. Patrick Ryan, characterized September 11, 1973 as Chile's "day of destiny," and "Our D-Day." Washington's warm reception of the military junta was the antithesis of its approach to the Popular Unity government. National Security Decision Directive 93, signed by Kissinger on November 9, 1970, called for the United States to "maximize pressures on the Allende government to prevent its consolidation." U.S. policy toward the military junta, by contrast, was designed to alleviate pressure on the generals so they could quickly consolidate power. Publicly, the Nixon White House supported the junta by turning on the spigot of economic assistance to alleviate food shortages in Chile. Three weeks after the coup, the Nixon Administration authorized $24 million in commodity credits to buy wheat—credits that had been denied to Allende's government. In the same briefing paper on Chilean executions, Assistant Secretary Jac Kubisch informed Kissinger that the United States had provided a second $24 million in commodity credits to Chile for feed corn and planned to transfer two destroyers to the Chilean Navy. The secret situation reports also stated that junta President Pinochet had ruled out "any time table for turning Chile back to the civilians." "Internationally, the Junta's repressive image continues to plague it," states the Kissinger briefing paper, drafted on November 16, 1973. Reports of mass arrests—U.S. intelligence put the number at 13,500—summary executions, torture and disappearances of Chilean citizens appeared in the world press almost immediately following the coup. The Nixon Administration, declassified U.S. embassy cables show, was concerned primarily with two problematic American casualties: the execution of Charles Horman and Frank Terruggi in the National Stadium after the coup. Their deaths constituted a "difficult public relations situation," as one October 21, 1973 cable stated. The Kubisch report to Kissinger cited "heavy" media criticism and congressional inquiries on these two cases. In February 1974, Assistant Secretary Kubisch himself raised these cases with Chilean Foreign Minister Ismael Huerta, according to a declassified memorandum of conversation, "in the context of the need to be careful to keep relatively small issues in our relationship from making our cooperation more difficult." The records show, however, that continuing human rights atrocities became the dominant issue in U.S.-Chilean relations. By 1975, both in Congress and within the executive branch itself, human rights advocates were highly critical of the Ford Administration's continuing support for the Pinochet government. 1959. Under Eisenhower, US sent a Survey Team comprised of experts with “irregular warfare” experience to Colombia to assess the condition of the nation after a civil war, known as La Violencia that had ravaged the countryside. In Colombia, counterinsurgency, or low-intensity conflict (LIC) operations, have been in practice since long before the infamous Plan Colombia, and US recommendations have shaped the landscape of battle. 1962. A follow-up US Army Special Warfare team, led by the head of the Army Special Warfare Center, Yarborough, emphasized the need for more developed intelligence systems (critical for counter-insurgency operations), and for increased security measures. Yarborough established grounds for the formation of paramilitaries, which would come to be one of the deadliest forces throughout the conflict. Civilians and military members should be covertly selected to develop an underground civil and military structure. 1962. Kenney launched the Alliance for Progress in 1962. This plan was advertised as an “economic development strategy for Latin America” that combined a “bullets and beans” strategy, heavy on the bullets. Colombia created a similar plan entitled Plan Lazo that drew from the US` previous recommendations. Under Plan Lazo, Colombia attempted to eliminate independent republics communist guerrillas had established, improve intelligence structures, increase unconventional warfare capabilities, and enact military civic action programs to regain the trust of the populace. Focused heavily on military intervention with few resources or administrative structures directed towards social reforms, it was largely unsuccessful. The majority of funding and focus of Plan Lazo and the Alliance for Progress was on military control of citizens and situations. Under the Kennedy administration, US Special Forces troops were expanded and counter-insurgent strategies prevailed. As it became clear that nuclear weapons were not enough to deter alternative opinions about the veracity of the status quo, the US began a significant shift in its use of counter-insurgent strategy. Though counter-insurgent strategy continued fail throughout the 60’s, military tacticians began again to tout its effectiveness at the dawn of the 21st century, welcoming a new era of COIN warfare in Colombia. Yet, for many Colombian citizens there is no liberation from the fear. The pause in action, is sustained and impacts livelihoods, health, and psychological well-being. The US trains and funds these Colombian troops. 1965. Following this recommendation, decree 3398 was passed in 1965 to allow Colombian authorities to organize citizens into militia groups. It stated that “all Colombians, men and women…will be used by the government in activities and work that contribute to the reestablishment of order”. 2000. The US has provided about $9.4 billion in aid to Colombia, of which about 6.8 billion has been in the form of military and police assistance. The US government throws words like security, democracy, and development and assumes that their definition is universal, correct, and infallible. Despite significant evidence to the contrary, the State Department certified that the Colombian government was in compliance with the human rights standards required by the US in order to receive full annual funding. This certification allows Colombian Armed Forces to receive all of its allotted aid from the US. For many in Colombia, security does not come in the form of a weapon, democracy is not delivered on the backs of military forces, and development is not something that comes by way of a military uniform. Counterinsurgency is neither enlightened warfare nor humanitarian. 2018. Duque won the election Duque is in the same party as Alvaro Uribe, who is under investigation for ties to paramilitaries and whose terms in office triggered the heightened militarization of Colombia and a spike in the killings of social leaders. Among the agency’s less known activities include the infiltration of hundreds of its agents into diplomatic offices, political parties and military forces in Ecuador. Agents at airports would report on passengers traveling to socialist countries such as Cuba and Russia, and mail sent to these countries was opened and recorded for the CIA to analyze. Any “special interest” guest in a hotel would be surveyed constantly. The U.S. Central Intelligence Agency (CIA), according to declassified documents and testimonies of previous agency officials, had a permanent operation to intervene in political and social decisions of Ecuador. 1960 Starting from the 60s, the CIA infiltrated governments, police, civilian groups, and NGOs to advance U.S. interests in the country, and continues to fight for its power and influence in the region. it had for South and Central America, as well as the impact on the new world order. In the early 1960’s, nationalist Ecuadorean President Jose Maria Velasco Ibarra and his later successor, Vice President Carlos Julio Arosemena Monroy, were pressured by the agency to break diplomatic relations with the new socialist government of Fidel Castro in Cuba. When both refused to isolate Castro’s government, both were successively ousted by the country’s military forces, backed by CIA operations. The agency’s main targets at the time were the young socialist or communist political groups in universities. The Revolutionary Union of Ecuadorean Youth (URJE) was considered the most dangerous organization and the main target for destabilization, along with its parent party, the Communist Party of Ecuador. 2009. An early general election was held on 26 April 2009 in Ecuador following the approval of a new constitution in a referendum held on 28 September 2008. 2013 Corea was re-elected as well as the National Assembly, Provincial Assemblies and members of the Andean Parliament. [Some reports indicated that Correa could be targeted by the CIA, given his strong opposition to U.S. intervention in the country and region., He closed a U.S. military base in Manta and said, “US could have a base if he could have one in Miami”, and expelled two U.S. diplomats who worked for the CIA. Correa has said “quality, free public education is the basis of a real democracy, and” the path away from a Third World raw material export dependent economy lies in raising the educational and skill level of the population. Education free, including university, and to reduce barriers for low-income students the government provides free school supplies, books, uniforms, and meals. Ecuador is completing a program of building 14 schools focused on teaching and preserving the country’s various ancestral ethnic languages. Free education is a human right, guaranteed through university. The UN recognizes only eight countries in the world as meeting the two minimum criteria for sustainable development including reducing the ecological footprint. Ecuador is one of them. Ecuador made major advances in converting to renewable energy Ecuador now counts on 95% renewable energy, By 2015 Ecuador had cut the rate of deforestation in half, and pays communities, mostly in the Amazon, to protect forests. 2004,the Salvadoran media and certain US government and non-government officials stoked fears amongst the voters regarding the consequences of an FMLN victory by again linking the FMLN to the Venezuelan socialist. In 2009 civic associations not registered as political parties carried out media campaigns associating the FMLN with Chávez in order to stir up support for ARENA. Ln 2014 even before the election there were articles criticizing Venezuela and especially ALBA. Sanchez Ceren's may need to enter into a coalition with Tony Saca to assuage fears that the FMLN will pursue communist or ‘Chavista’ policies and Sánchez Cerén need to demonstrate that Venezuela’s influence and money can be kept at arm’s length. (Brocking Institute Diana Negroponte).The ARENA candidate used the reported situation in Venezuela to support his campaign, "we do not want our country to fail as Venezuela has". There were constant references in the right wing paper the Prensa Graphic and TV reports profiling suffering Venezuelans and warning .Salvadorians not to vote for the FMLN candidate. A full page about US and Venezuela. Head line Venezuela falls short in human rights; the United States put Cuba Venezuela and Ecuador in a list of countries that do not respect human rights, citing corruption, impunity, the lack of judicial independence, restrictions on freedom of speech as problems in all of Latin America. Head line senators urge sanctioning repression. Head line they warn that the Venezuelan crisis could affect ALBA. Negative publicity about alba and especially about Venezuela to support ARENA .ARENA candidate warned that the FMLN Sanchez Ceren would follow the path of Venezuela’s socialist government, which has taken over private businesses, and promised he would not allow others to send el Salvador down the road of Venezuela. In the Prensa Grafica. February 28, 2014 front page the Venezuelan crisis worsens information about Venezuela in 5 other pages. 1932. In January 1932, the Salvadoran people along with the Communist Party under Marti`s leadership rose up against the dictatorship of Maximiliano Hernandez Martinez . The regime responded with brutal repression , killing 10,000 and 40,000 people. Marti was sentenced to death on January. 31, 1932 and was executed by firing squad the following day. It is reported that his cry of, “Long live socialism!” was interrupted by the impact of the bullets. 1980. October 10, the FMLN (Farabundo Martí National Liberation Front)`In March, Archbishop Oscar Romero and four nuns were murdered. Roberto D’Aubuisson, right-wing death-squad leader was suspected. 2009, The right-wing media in El Salvador played up links between the FARC and the FMLN, alleging that the FMLN had not left its terrorist past behind and that its members were involved in arms trafficking and organized crime. The EU delegation, similar to the Transparency International monitors, found that “election news coverage was generally biased not meeting international democratic standards, exacerbating the uneven playing field in favour of ARENA and an observer report estimated that ARENA spent over twice as much as the FMLN in advertising) and that media ownership concentration was held by the influential families, associated with ARENA, had distorted the level playing field of electoral politics. In 2009 civic associations not registered as political parties carried out media campaigns associating the FMLN with Chávez in order to stir up support for ARENA. 2014. those residing outside could now A representative from the Bush era hinted in a panel discussion that if a certain party were elected the US would have to think twice about assisting el Salvador with funds. Front page of the Prensa Grafica was Norman (ARENA) signing the 1994 declaration of Chalpultepec inside a full page about his signing as well as the full Declaration. The impression was given that Sánchez Cerén would not sign the declaration; hidden away in a subsequently article was mention that both parties had signed on. Ln 2014 even before the election there were articles criticizing Venezuela and especially ALBA. Sanchez Ceren's may need to enter into a coalition with Tony Saca to assuage fears that the FMLN will pursue communist or ‘Chavista’ policies and Sánchez Cerén need to demonstrate that Venezuela’s influence and money can be kept at arm’s length. (Brocking Institute Diana Negroponte).The ARENA candidate used the reported situation in Venezuela to support his campaign, "we do not want our country to fail as Venezuela has". There were constant references in the right wing paper the Prensa Graphic and TV reports profiling suffering Venezuelans and warning .Salvadorians not to vote for the FMLN candidate. A full page about US and Venezuela. Head line Venezuela falls short in human rights; the United States put Cuba Venezuela and Ecuador in a list of countries that do not respect human rights, citing corruption, impunity, the lack of judicial independence, restrictions on freedom of speech as problems in all of Latin America. Head line senators urge sanctioning repression. Head line they warn that the Venezuelan crisis could affect ALBA. Negative publicity about alba and especially about Venezuela to support ARENA .ARENA candidate warned that the FMLN Sanchez Ceren would follow the path of Venezuela’s socialist government, which has taken over private businesses, and promised he would not allow others to send el Salvador down the road of Venezuela. In the Prensa Grafica. February 28, 2014 front page the Venezuelan crisis worsens information about Venezuela in 5 other pages. 2014. Right wing media claimed outside influence and the electoral tribunal failed to restrain ALBA Petróleos actions despite the fact that Section 67 of the electoral law prohibits contributions to political parties from government institutions or businesses The US government and its Embassy claim that they have remained neutral observers. 2014. March Salvador Sanchez Ceren of the FMLN was declared winner but ARENA contested the results, alleging fraud.2014 press conference in San Salvador where ex pats were discussing the fact that, on a technicality, ARENA nullified 400 votes from the exterior. 2015. March 5 The (ARENA) party took control of El Salvador’s legislature ARENA won 32 out of 84 seats in congress. The FMLN) won 31 seats. In the new congress, both ARENA and FMLN will have to negotiate in order to pass bills since neither party will have a simple majority. Following its 1944 revolution, which brought democratically elected leftist governments to power; Bolivia faced an increasingly hostile neighbour to the north, the United States. Guatemala's treatment of US-based corporations, especially the United Fruit Company, in expropriating land and other assets, did nothing to improve relations. Elites in Guatemala helped persuade US journalists and members of Congress, and the executive branch, that their government was veering further and further leftward toward Communism 1950s.Late in the Truman presidency, the US government aborted an attempt to support Guatemalans who aimed to overthrow President Jacobo Arbenz. President Eisenhower, Secretary of State John Foster Dulles, and DCI Allen Dulles persuaded themselves that the Guatemalan government was "red." The CIA leader said, "The Communists now effectively control the political life of Guatemala." 1 A deal made by Arbenz's government to purchase Soviet-made armaments from Czechoslovakia sealed the matter in the US leaders' minds. 1954 Washington used the CIA and US Ambassador John Peurifoy to support and direct certain Guatemalan military leaders in overthrowing Arbenz's government. It was also psychological warfare--cleverly deceptive efforts to persuade Guatemala's citizens and political/military leaders that a major invasion force was moving toward the nation's capital so unnerved Arbenz and others that the government fell without much of a battle. While the overthrow of Arbenz was unfolding, the US government pretended to have nothing to do with it. nited States had a right to assist the revolt." In consultation with the State Department, Johnson offered his colleagues and those in the House an opportunity to give support to Eisenhower with "an unmistakable warning that we are determined to keep Communism out of the Western Hemisphere. “William Langer of North Dakota voted "no." He was dismissed as an old-fashioned isolationist. His statement when Joseph McCarthy's anti-Communist crusade was still on-going, in retrospect, not easily dismissed. 1960s The US was involved in equipping and training Guatemalan security forces that murdered thousands of civilians in the nation's civil war. 1960s and 1970s.The US gave the Guatemalan military $33 million in aid even though US officials of knew the army's disregard for human rights. 1992 A CIA cable confirmed that indigenous villages were targeted for destruction because of the army's belief that the Indians supported the guerrillas. It reported that "several villages have been burned to the ground". "This well-documented belief by the army that the entire Ixil Indian population is [pro-guerrilla] created a situation in which the army can treat combatants and non-combatants alike". 1994 Defense Intelligence Agency report outlined how, in the 1980s, Guatemalan military intelligence agents dumped suspected guerrillas – dead or alive – out of planes into the ocean to remove the evidence showing that the prisoners were tortured and killed. 1996 The UN brokered a peace agreement that ended the conflict. 1998 Todos Santos is a predominantly indigenous village in the highest mountain range in Central America. A Dutch anthropologist thereat and she reported that a women knowledgeable about local medicinal plants was deemed by the fundamentalist church, to be a sorcerer. A documentary claimed Todos Santos was discovered by the rest of the world in the 60’s when a road was put in so as to make Indian labour more available for the coffee and cotton fincas. It also claimed that about 45% of the land is owned by 2 -3 % of the population (ex-military ladinos) while the less desirable land was divided among the indigenous people. 1999, President Clinton visited Guatemala and said, "Support for military forces and intelligence units which engaged in violence and widespread repression was wrong, and the United States must not repeat that mistake." 2015, the U.S. Congress approved $750-million (U.S.) in aid to the Guatemala El Salvador and Honduras on their efforts to reduce migration to the United States and the factors driving it. 2015 A fundamentalist Christian, Jimmy Morales, comedian and was elected as president. He favoured low taxes limited government and promised to fight against graft. 2016 Prosecution of his allied lawmaker was suspected of human rights violations dating to Guatemala's civil war. The film stressed the importance of memory; memory needs something to keep it alive if no, it burns out like a candle; it needs images and words to leave no trace of the struggle as if they never existed as if they were never among us. In the film memory is beautifully revived through an artist recapturing visually memories of the disappeared The case of the disappeared was brought before the Inter-American Court of Human Rights where the decision was favourable and compensation was recommended. Yet the struggle goes on! 2018 US congratulates Jimmy Morales from Guatemala for supporting Jerusalem as capital of Israel and for opposing Venezuela and the crisis in Venezuela and its abusive dictator (translate from Spanish CNN, meeting with Trump and US UN representative. 1018 BP Copan a Mayan site with an extraordinary hieroglyphic staircase. The ruined citadel and imposing squares reveal three main stages of development before the city was abandoned over a 1000 years ago. 1890 foreign control enclave, US military presence in Honduras and the roots of Honduran migration to the United States are closely linked. It began in the late 1890s, when US-based banana companies first became active. The US and its companies “built railroads, established their own banking systems, and bribed government officials. As a result, the Caribbean coast “became a foreign-controlled enclave that swung the whole of Honduras into a one-crop economy whose wealth was carried off to New Orleans, New York, and later Boston. 1914 US banana interests owned almost 1 million acres of Honduras’ best land. These holdings grew through the 1920s to such an extent that, as Honduran peasants had no hope of access to their nation’s good soil.” Over a few decades, US capital also came to dominate the country’s banking and mining sectors, this was coupled with direct US political and military interventions to protect US interests in 1907 and 1911.The superpower was behind the rise of the original banana republic – and the fall of its latest president. The fruit corporations from the US turned Honduras, an impoverished tropical backwater, into a huge banana plantation at the start of the 20th century. They dominated its economy and politics, making it the original "banana republic”. US intervened in numerous military coups to protect its commercial interests, embedding conservative, Americanized elite. 1980s Contra guerrillas backed by President Ronald Reagan used Honduras as a base to attack Nicaragua's Sandinista government in the 1980s. The US has used the Soto Cano base for several decades, saddling it with a somewhat infamous record. During the 1980s, Palmerola was part of a sizeable tract of land, became known as the Nicaraguan contras’ “unsinkable aircraft carrier.” from there, the US–backed irregulars launched raids into Nicaragua. Overarching role would be to support Honduras’ war against drug traffickers. It is unclear what other US security operations will take place at the air base under the rubric of safeguarding this country’s national interests. 1989 Nicaraguan contra insurgents training in Honduras. The rightwing rebels were backed by US. At that time, US political and military policy was so influential that many referred to the Central country as the “U.S.S.Honduras ” and the Pentagon Republic.The US has had a lasting presence in modern Honduras, primarily at the Soto Cano airbase, which has witnessed scores of human rights abuses during the 1980s. 1983. At that time, US bribed Honduran officials who closed their eyes to the fact that US backed insurgents were staging sorties into Nicaragua from Honduran territory. 1999 Honduran troops were members of the sinister battalion 3-16, accused of scores of kidnappings and human rights abuses against Honduran anti-contra dissidents. The nacla report on the Americas announced that three mass graves and prison cells had been discovered at the former contra military base of El Aguacate, near the Nicaraguan border. This facility had been built by US troops in 1983. The contras used the gravesites to dispose of the prisoners they had executed on political grounds. Destabilizing Nicaragua had the perverse effect of destabilizing Honduras, where civilian authorities have been reduced to rubber-stamping the militarization of their country to counter the alleged “communist threat” posed by the Sandinistas. Eventually 30,000 lives were lost and economic ruin in both Nicaragua and Honduras, occurred, in what soon became a US.-induced civil war. 2006 Election of Manuel Zelaya, a liberal reformist, as president; in 2006. He led on progressive measures such as raising the minimum wage. he also tried to organize a plebiscite to allow for a constituent assembly to replace the country’s constitution, which had been written during a military government; these efforts incurred the ire of the country’s oligarchy, leading to his overthrow by the military in June 2009.It was said he that had ignored court rulings that made his referendum unconstitutional and was seeking to perpetuate his presidential term like his ally, Venezuelan president Hugo Chávez, had already done in Venezuela on numerous occasions. President Manuel Zelaya was taken to an air force base where he was escorted onto an airplane that immediately left the country for Costa Rica. Obama, showed a desire to end the "gringo bully" image by condemning the June coup which ousted the leftist leader, Manuel Zelaya. But the white house backtracked when congressional republicans supported the de facto government as a bulwark against Chávez. Zelaya snuck back into the country via a mountain pass and tried to negotiate a deal that would allow him to retake the presidency until the end of his term. Lobo was elected and the country’s political and economic elites had turned the clock back to the 1980s with the help of the military The US government only reinforced this belief when it recognized the Lobo administration and in 2010 Secretary of State Hillary Clinton, worked to ensure that Zelaya did not return to power, and was criticized by hemispheric political forum. 2009 President, Barack Obama, showed a desire to end the "gringo bully" image by condemning the June coup which ousted the leftist leader, Manuel Zelaya. But the White House backtracked when congressional Republicans supported the de facto government as a bulwark against Venezuela's Hugo Chávez... It was said he had ignored court rulings that made his referendum unconstitutional and was seeking to perpetuate his presidential term like his ally, Venezuelan President Hugo Chávez, had already done in Venezuela on numerous occasions. Behind “the 2009 coup” in Honduras was the specter of Venezuela. Zelaya had turned to leftist coalitions and unions for support of his agenda and to the horror of the political elites, he joined petrocaribe and the Bolivarian alternative for the Americas (Alternativa Bolivariana Para las Americas – ALBA), Chavez’s regional economic and political alliance, which acted as a counterweight to the US-led trade agreements in the region. 1519-21 Spanish–Aztec War (1519–21), and cultural misappropriation such as destroying pyramids and building churches with the stones or building churches above the ruins of pyramids, and also inappropriately renaming codices as ``Codex Borgia`` or ``codex Vaticanus``. 1910 Under the regime of Porfirlo Diaz (1876-1910). Often, lands traditionally held communally by indigenous peoples were seized. In many cases, these seizures took place without due process and the land turned up in the hands of President Diaz' supporters. 1846-48 The Mexican–American War, also known as the Mexican War in the US and as the American War in Mexico. 1968 Tourism began in the Yucatan and polluted many of the cenotes. 1930. Ejidos were protected. They could be farmed only by members of the community. 1929-2000 PRI, the Institutional Revolutionary Party. In 1990s, PEMEX disrupted the Olmec culture in Mexico. And surrounded the oldest pyramid in Mexico at La Venta, and relocated Olmec heads. 1992 Ejidos and NAFTA. Before NAFTA half of Mexico's total land mass was held in 28,000 ejidos, occupied by more than 2.5 million farmers. President Salinas proposed to open land ownership for greater market discipline by better defining property rights. Under the new rules, members of an ejido collective can rent land to non-ejido members, and can obtain full rights to the land-including the right to sell to others. 1990s, PEMEX disrupted the Olmec Culture In Mexico by surrounding the oldest pyramid in Mexico at La Venta, and displacing Olmec giant heads from original site. 1994 NAFTA was in force. In protest, 100 farmers formed a human wall along the border. 2000 An Alliance was formed to defeat the PRI; the PT and PRD joined PAN`s Vincente Fox. 2000 During the election UNICEF promoted the Convention on the Rights of the child. 2005 Washington’s proposed "Free Trade Area of the Americas" was rejected by the region. 2006 Calderon appealed to security and attacked Obrador as a danger to security. Election law prevented Vicente Fox from making public statements of a partisan or political nature. But he often did in the 2006 campaign, in speeches reinforcing candidate Calderón's basic message that Obrador was a "danger to México." PAN used attack ads against Obrador, comparing him to Venezuela's Chávez and calling him a "danger to México` `At stake in the election was whether Mexico would continue its free-trade policies and close alliance with the US or join a growing number of Latin American nations who have elected leftist leaders who favour more government intervention in the economy. 2008 Mega march against NAFTA demanding the renegotiation of sections in NAFTA, opposing the dumping of US produce on Mexico, and the increased privatization of electricity, highly mechanized U.S. corn and grain producers will force small ejidos to consolidate or change crops. Concern about waves of migrants leaving rural Mexico as agriculture is modernized. 2010 COP16 climate change held in Cancun- the symbol of overconsumption, an interesting contrast to the BALUMKU, near Mahual, which is completely off the grid. 2012, the PRI won back the presidency with the election of Enrique Peña Nieto. 2014 NAFTA: 20 years of regret for Mexico excerpts from Mark Weisbrot: The promised trade surpluses with Mexico turned out to be deficits. The idea was to push US wages downward, and to create new rights for corporations to sue governments directly before a corporate-friendly international tribunal, unaccountable judicial systems, for regulations (e.g. environmental) that infringed upon their profit-making potential. Millions were forced into competition with subsidized US agribusiness. 2015 In Guanajuato, a Canadian mining company spilled about 1,200 gallons of toxic waste into a river which is 7 kilometres from the world heritage site. At one time eight out of the ten mines close to the World Heritage site were Canadian and often they were polluting the river. 2018 Obrador from the Morena party won the election in spite of all the fear mongering. The case of Venezuela is instructive, and ongoing. Its citizens are desperately heading for the border as that nation's socialist economy collapses, beset by food shortages, soaring unemployment, rampant disease, crime and inflation now at a stratospheric 43,000% a year. Since 1999, the year the socialists took over, Venezuela's economy has gone from being one of the wealthiest in Latin America, with the world's largest oil reserves, to one of the most-impoverished nations in Latin America, one that now imports oil and exports people. (Investors Daily). US Marines had occupied Nicaragua since 1909 and finally left in 1933. When the marines left in the 1930s, they handed things over to the Somoza family, which ruled Nicaragua with U.S. support from the 1930s to the 1970s. 1980 Daniel Ortega elected president and national literacy begun. 1986 The International Court of Justice yesterday ruled that US support to the contras in Nicaragua is illegal, and demanded that the US pay reparations to the Sandinistas. Nicaragua intends to sue the US for more than dollars 1 billion in damages in US domestic courts as a result of yesterday's World Court ruling, a legal counsel for the Managua Government said yesterday in Washington. In a 16-point ruling on a complaint lodged by Nicaragua , the judges rejected American claims of collective self-defence and found the US guilty of breaches of international law and the 1956 treaty of friendship between the two countries. The US rejected the judgment, claiming that the Managua regime is a Soviet puppet. Note the US said that they recognized the jurisdiction of the court but would not abide by the decision. Soon after that the US withdrew from the ICJ. 2006-2018 . US right wing groups were raising money in the US to support opposition in Nicaragua. 2006 Media claimed Ortega would win because of right wing split!. 2007 food, low-interest credit and other types of direct support Venezuela has pumped into to alleviate poverty, and funds that helped improve education, sanitation and gender equality. 2014 right-wing activists ambushed a caravan of Sandinista supporters returning from the annual celebration of the revolution, killing five people and wounding 24. A report by the Congressional Research Service described Ortega as “the most popular political figure in Nicaragua”. That same month, State Department official Juan Gonzalez acknowledged that Ortega was supported by the majority of the population, attributing his support to “a lot of the social investments that he has made in the country. “Regardless, U.S. officials have not abandoned their efforts to remove Ortega from power. 2017 the “Nicaraguan Investment Conditionality Act (NICA) of 2017”. 2017 The government of Nicaragua has rejected the decision of the US to sanction Nicaragua through the so-called Nica Act and demanded respect for its sovereignty. Nicaragua also demanded that the US pay a compensation it was ordered to disburse in 1986 by the ICJ for “the fatal damage caused to the people and government of Nicaragua for the destructive and illegal interference of that power in our national affairs” in funding Contras during the country’s civil war. US continues funding the opposition and supporting opposition protest The assistance programs appear to be having some effect, especially now that opposition groups are leading major protests against the Nicaraguan government (Edward Hunt). U.S. officials hope the country’s opposition groups will create a new political movement that can defeat Ortega at the polls or pressure him into stepping down from power. They fear that without their support, Ortega’s opposition will remain weak and divided, making it impossible for anyone to mount a successful political campaign against the Nicaraguan president. “Our assistance programs are primarily directed at civil society, in order to limit engagement with the central government,” State Department official Juan Gonzalez told Congress in September 2016.
. After the Nicaraguan government passed a number of mild reforms to the country’s social security program in April, Ortega’s opponents organized a series of protests that quickly turned violent. Observers estimate that as many as 45 people died in the protests. Since the protests began, U.S. officials have declared their support for the opposition, blaming the Nicaraguan government for the violence. They have not said if any of the protesters have benefited from their assistance. While questions remain about the extent of U.S. involvement, it is no secret that the United States has historically played a heavy-handed role in Nicaragua. During the early 20th century, U.S. marines occupied the country for two decades. When the marines left in the 1930s, they handed things over to the Somoza family, which ruled Nicaragua with U.S. support from the 1930s to the 1970s. During the late 1970s, the Sandinistas ousted the U.S.-backed Somoza dictatorship in a popular revolution. Following the revolution, Ortega led a new government that began putting more resources into education and health care, helping to increase literacy and reduce child mortality. To prevent the revolution from succeeding, U.S. officials directed two major campaigns against the Sandinistas. During the mid-1980s, the Reagan administration organized a terrorist war against Nicaragua, backing counterrevolutionary forces (“contras”) that tried to overthrow the new Nicaraguan government. As the contras waged their campaign of terror, U.S. officials began supporting Ortega’s political opponents, helping them gain political power through the country’s presidential election in 1990. In the following years, U.S. officials remained closely involved with their political allies. U.S. diplomatic cables published by WikiLeaks reveal that U.S. officials continued working to keep their political allies in power while preventing the Sandinistas from regaining political power. Before the presidential election in 2006, U.S. diplomats spearheaded a multi-faceted campaign to steer campaign funds to their political allies while discouraging voters from voting for Ortega. In spite of these efforts, U.S. meddling was not enough to tilt the presidential election in favor of U.S.-backed candidates. Ortega won, bringing him back into office and providing the Sandinistas with an opportunity to revive their revolution. U.S. diplomats in Nicaragua were stunned by the result. They called for an intensification of programs to confront Ortega. “We need to take decisive action and well-funded measures to bolster the elements of Nicaraguan society that can best stop him before he lulls the majority of the Nicaraguan people into complacency, or threatens them into silence,” they reported. In September 2016, U.S. official Marcela Escobari told a congressional committee that U.S.A.I.D. was working with more than 2,000 “young people” and over 60 civil society organizations to help them play a more active role in Nicaraguan politics and society. “These efforts are allowing them to exercise their political muscle and see results,” she said. It has not always been easy for U.S. officials to mobilize opposition, however. Since returning to power, Ortega has created a number of popular social welfare programs, providing Nicaraguans with free education, free health care, and various home-improvement programs. The programs have been quite effective, raising incomes and significantly reducing poverty. The programs have also bolstered Ortega’s popularity, especially among the poor. 2018 Earlier this year, U.S. Ambassador to Nicaragua Laura Dogu complained that international investors face too much risk in the country. She said the country’s cheap labor, which she called its “main competitive advantage,” was losing its appeal. “As more activities are done by robots, the cost of labor becomes irrelevant,” she said. Dogu insisted that the Nicaraguan people must accept sweeping economic reforms if they want their country to remain relevant in the global economy. She called for more vocational training for young people and the introduction of genetically engineered crops into the country. “Nicaragua can choose to capture emerging markets and growth industries… or can chose to be left behind as other countries seize those opportunities,” she said. (1) The House Committee on Foreign Affairs convened a congressional hearing on December 1, 2011, entitled “Democracy Held Hostage in Nicaragua: Part 1” where former United States Ambassador to Nicaragua Robert Callahan testified, “First, that Daniel Ortega’s candidacy was illegal, illegitimate, and unconstitutional; second, that the period leading to the elections and the elections themselves were marred by serious fraud; third, that Daniel Ortega and his Sandinista party have systematically undermined the country’s fragile governmental institutions.”. 2004 ALBA Cuba- Venezuela agreement, [signed on December 14, 2004, aimed at the exchange of medical and educational resources and petroleum between both nations. Venezuela began to deliver about 96,000 barrels of oil per day from its state-owned oil company, PDVSA, to Cuba; in exchange, Cuba sent 20,000 state-employed medical staff and thousands of teachers to Venezuela's poorest states the agreement also made it possible for Venezuelans to travel to Cuba for specialized medical care, free of charge. Subsequently, a number of other Latin American and Caribbean nations entered into this 'peoples' trade agreement' which aims to implement the principles of ALBA. 2009 Expelled Israeli ambassador, and recognized Palestine. 2009 U.S. troops in Colombia: a threat to peace.US military will be granted the use of five military bases in Colombia, in addition to the two it already uses, to fight drug trafficking and guerrillas on the Venezuelan border. 2009 Criticized wealthy north at COP 15 climate change conference. 2010 Participated in Cochabamba climate change Peoples Conference in Bolivia. 2012 Is a charter without social rights, a gift to the world? UN watch targets– socialist states and ones that criticized Israel. 2013 Venezuela’s social missions progressing. Canada’s shameful response to the death of Chavez. 2014 June 20 destabilization schemes designed to demonstrate that governments considered hostile to US` interests are ruthless and undemocratic span many decades and continents. There is one highly effective type of manipulation that is frequently employed: peaceful protests are combined with violent ones as the media and opposition conflate the tactics used by security forces against the former and the justified use of force against the latter. 2015 letter re Colombia border conflict. 2015 the making of Leopoldo Lopez 2015 Leopoldo not Venezuela Saviour. 2016 Venezuela bans GMOS by popular demand. 2017 trump doubles down on sanctions – regime change. 2017 trump sanctions will cause more harm. 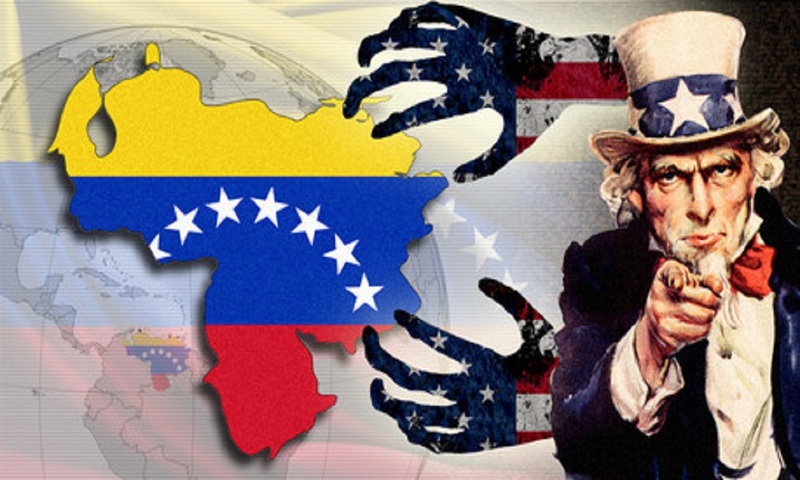 2017 Venezuela – regime change invasion? 2018 human rights council condemns Venezuelan sanctions. 2018 Nicolas Maduro wins May 20 election; Lima group does not recognize election (Peru, Argentina, Brazil, Mexico, Panama, paraguay, santa lucia, Canada, Colombia, Honduras, Costa Fica and Guatemala). 2018 visit of us southern command a threat of invasion? was their best chance since 1998 to oust ‘Chavismo’ from power and so, when its candidate, Henrique Capriles Radonski, lost to Nicolas Maduro by a mere 1.5 per cent, they cried fraud and launched a wave of violent protests and riots that left at least nine dead. The following year the opposition launched another wave of violent protests (known as ‘guarimbas’) that lasted about three months and left 43 people dead. This opposition tactic, which the opposition tried again in 2017, was immensely effective on an international level because every time it was applied, and people were killed (usually by the protesters themselves), the international perception of Venezuela – as mediated by international news outlets – was significantly worsened. It was thus only a small step to routinely begin to refer to Venezuela as a dictatorship, despite its more than annual electoral contests. Following Chávez’s death, Venezuela’s economic situation began to deteriorate. The inflation rate rose from 21 per cent in 2012 to over 100 per cent in 2015 (hyper-inflation in 2018), basic consumer items and of food staples became difficult to purchase because of shortages, oil revenues dropped by two-thirds, from $77 billion in 2012 to $25 billion in 2016 – This gave the opposition additional reasons to launch ever-more attacks on the government. The reasons for the economic crisis are manifold, a confluence of a fixed exchange rate, a concerted business sector effort to undermine the economy, declining oil prices, and – beginning in 2017 – US financial sanctions, all of which combined to create one of the worst economic crises in Venezuelan history. negotiated solution to Venezuela’s political crisis. On February 9, he appeared to support a military coup when he tweeted: “The world would support the Armed Forces in Venezuela if they decide to protect the people & restore democracy by removing a dictator.”Rubio/Trump strategy seems to be to try to worsen the economic situation and increase suffering to the point where either the military, or the insurrectionary elements of the opposition, rise up and overthrow the government.That appears to be the purpose of the financial sanctions that Trump ordered on August 24, 2017. This was not done previously because it would hurt US oil refining interests that import Venezuelan oil. But the administration has floated the idea of tapping the US strategic petroleum reserves to soften the blow. All this to overthrow a government that nobody can claim poses any threat to the United States. The main opposition coalition, the Democratic Unity Roundtable (MUD, by its acronym in Spanish), has as of now decided to boycott the elections.